It's that time of year when we all look back and reflect on the memorable things of this past year. There were some bittersweet moments like RT Book Reviews closing up shop after 37 years. Here in alphabetical order is my top Twenty Reads of 2018. 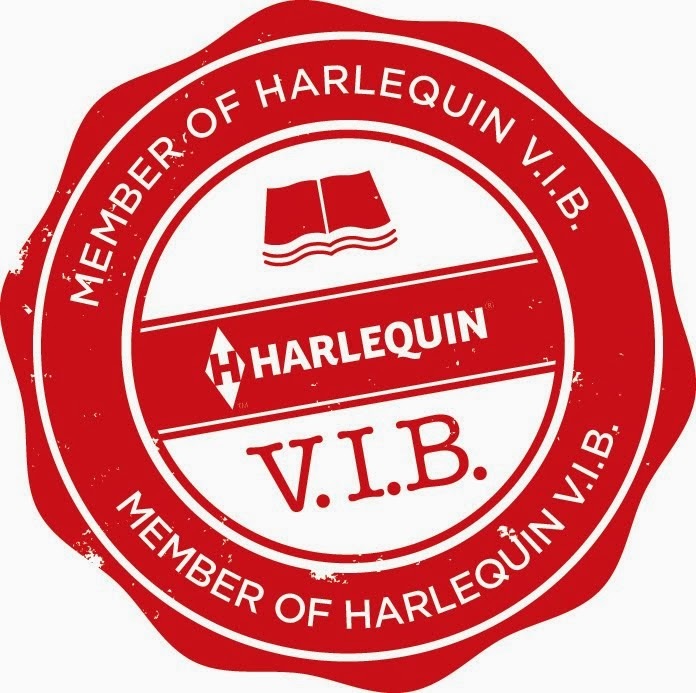 There are some old friends and some new finds, a cornucopia of genres some print reviews some audio, some fiction and some non-fiction and all unforgettable. Set from the beginning of the twentieth century through the 1930’s and centered in the NY garment district, Gross’s latest historical thriller, Button Man is a fast paced, epic tale that follows the life and times of one Jewish immigrant family and especially one member of the family and his fight against the corruption of the unions that instead of fighting for the workers strong armed, maimed and killed to get a company and owner’s compliance. The author’s use of real crusaders like Thomas Dewey NY’s DA and both Jewish and Italian mobsters like Louis Buchalter, Dutch Schultz and Lucky Luciano and their crime syndicate called “Murder Inc.” make the novel more genuine and more chilling. The narrative is period perfect bringing to life for the audience the realistic sights and sounds of New York from early 1900 through the roaring twenties complete with mob run speak-easies and clubs and on through the bullet ridden crime filled union enforcements of the 1930s garment industry. Morris is an unforgettable character, a hardscrabble, never give up, honest businessman and loving family man, but one who’s also prideful and imperfect. The secondary characters are also fantastic some memorable and some extraordinary. 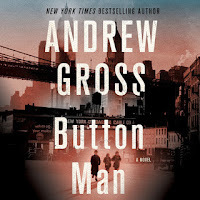 All in all The Button Man is a must read for all lovers of historical fiction who love facts with their fiction. Brava Mr. Gross! The Narration by Edoardo Ballerini is amazing giving life to the characters. His male voices are pitch perfect and he does well with the female roles too. But the pièce de résistance is the emotions he gives to Morris and his family with every Yiddish phrase and every angry arrogant mob voice. Genevieve reached out to me last year about her previous historical novels and I simply fell in love with her historical tales of Canada. Now she's a go to for me. 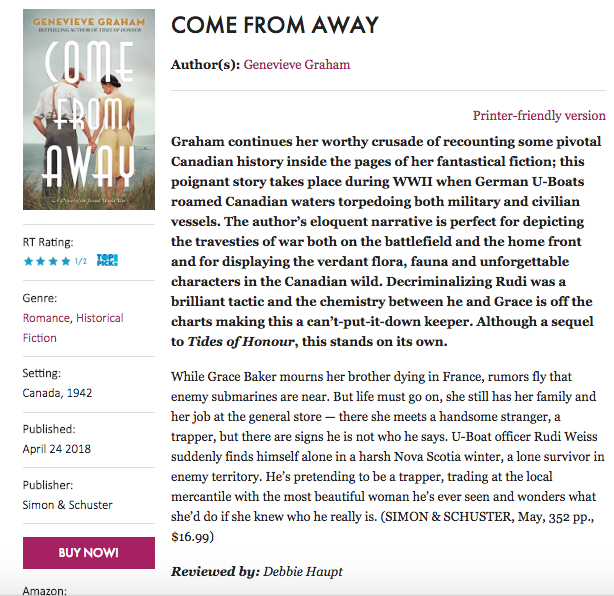 Come From Away is one of my last reviews for RT Book Reviews. 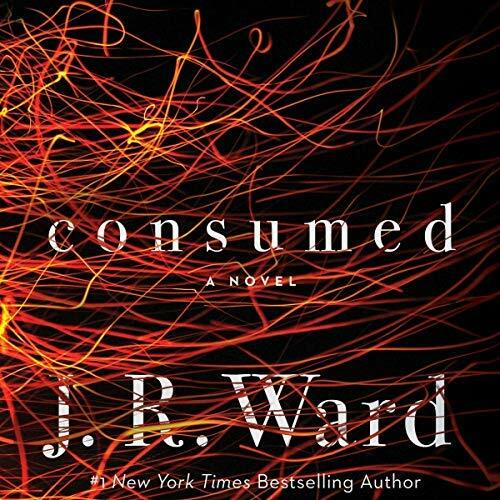 The first book in J.R. Ward’s newest mini-series is a non-stop thrill ride featuring some amazing adrenalin junkies and staring a couple whose attraction is as combustible as the emotional baggage they carry. 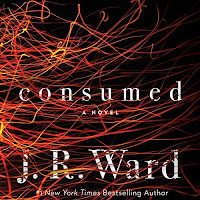 First books in a series have a lot to do, they must introduce readers/listeners to all the players, places and plotlines and this master storyteller does a glowing job ­–­ nailing it from the first breath-stealing chapter until that coveted ah-ha moment and tying it up just enough while also leaving fans salivating for the next installment. Fans of the Warden’s Black Dagger Brotherhood series will recognize the streetwise dialogue and larger than life characters only this time she gives us first responders instead of Vampires. The premise is exhilarating, the characters are amazing, her star-crossed couple are marquis worthy headliners and her handling of some really dicey situations Rock! 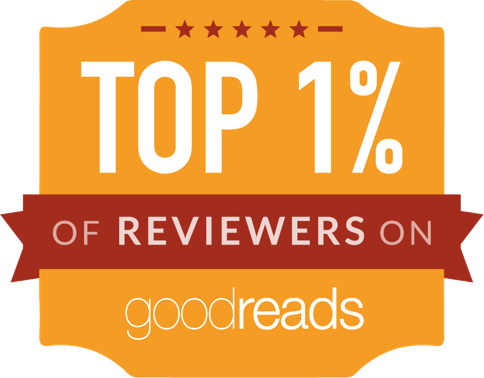 Fans of contemporary romantic suspense and all lovers of one heck of a good story will have this heading to number one on all the bestseller lists in no time. The multitalented stable of narrators for this story, including Jim Frangione who narrates The Black Dagger Brotherhood series, all totally rock, nailing emotions, inflections, and some brilliant New England accents and treating listeners to the story’s full monty. 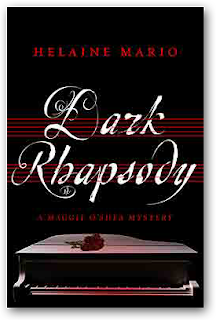 Dark Rhapsody is the second in Helaine's Maggie O'Shea novels and I love her storytelling method. After the harrowing events of the last few months including almost being the victim of a sadistic killer Maggie O’Shea is ready for healing and some well earned normalcy. She’s getting stronger every day, practicing her precious piano and almost ready to start performing as a concert pianist again. There’s a lot to be thankful for and although the pain of losing her husband is still a raw ache she has found a way to cope and even better she’s found love again. Colonel Michael Jefferson Beckett, an agent for the Department of Justice, is battle-scarred but loyal almost to a fault and would protect Maggie at any cost even keeping her in the dark when the madman who recently tried to kill her strikes out against him hoping for a clear a path to her. Little do they know they will both soon be knee deep in mystery, secrets and danger involving not only a killer from Maggie’s past but also art stolen by the Nazis keeping them on their toes and unfortunately in the line of fire. 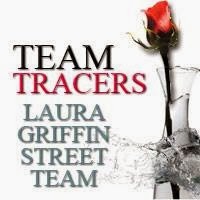 Laura is another author I love and I'm proud to be on her review team. 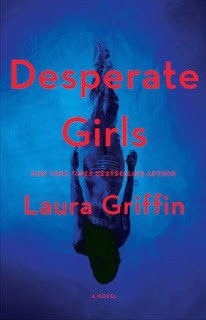 Desperate Girls is a Stand Alone Romantic Suspense really heavy on Suspense. Defense attorney Brynn Holloran is at the top of her game and she’s lead counsel on a big case starting soon in Dallas when she learns a sadistic killer she helped put behind bars when she worked as a prosecutor just escaped prison and he’s apparently started another killing spree only this time he’s targeting everyone who helped put him away. So far he’s killed the then lead prosecutor and a retired detective who worked the case. Afraid that Brynn and her partner have made that list her boss hires Wolfe Security, the best in the business to protect them. Brynn has a big problem with taking orders and soon she and her, ex-military, by the rules, buff bodyguard are butting heads while serious sexual sparks are lighting the night sky. Erik Morgan is a by the book kind of guy, when he tells a client to jump he expects to be asked how high, that is until his current client, the headstrong, bullheaded, impossible and beautiful attorney who’s in more danger than she thinks, who is constantly pushing his buttons and who he’s having trouble keeping at arms length. Heaven help him! 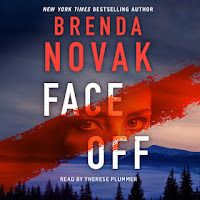 Face Off is #3 in Brenda's Eve Talbot series, the first one I read but I didn't feel lost at all. 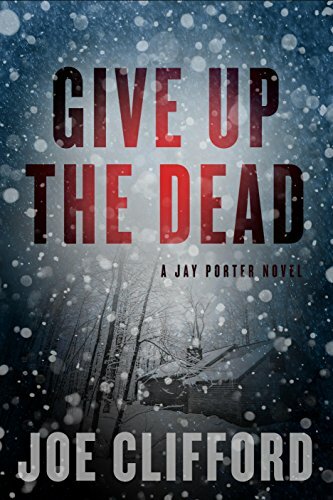 It was thrilling and chilling and set in Alaska gave it a unique perspective. Macmillan audio also granted me this audio review copy. At sixteen two of Evelyn Talbot’s friends were brutally murdered and she was tortured and left for dead by her then high school boyfriend Jasper Moore and even with multiple agencies looking for him has been killing ever since. Because of what she survived Evelyn became a psychiatrist and has devoted her life to the study of the psychopathic mind. She also knew she needed a facility to exclusively study these conscienceless killers and thanks to her fierce determination Hanover House Prison in Hilltop Alaska became a reality and she agreed to be in charge for at least five years. She’s also found a home and thanks to his tenderness finally against all odds, love with Alaska State Trooper Amarok. But not everything is perfect because he wants a commitment and she’s not sure she can until Jasper is once and for all put behind bars. Novak’s latest, Face Off, #3 in her Evelyn Talbot Chronicles is and unforgettable chilling tale about madness, murder and resolution. A non-stop, emotional rollercoaster ride giving readers goose bumps and not just from the cold Alaska weather. The storyline is fantastic, the landscapes lush, unforgiving and the perfect place for a serial killer to hide and to thrive. The content is horrifyingly provocative and the characters both the good and evil costars and the fantastic main stars of Evelyn and Amarok are unforgettable. It’s the extremes that make this installation in the series so memorable, the internal battle Evelyn is constantly going through, Amarok’s futile feelings of being able to protect Evelyn and also the battle of the prison vs the townspeople who want it and it’s dangerous inmates gone. And Novak, the master of romantic suspense puts together all the puzzle pieces perfectly right up to the “OH MY GOD” ending. This is one of those series that will leave lasting impressions long after “the end”, and is a must read for romantic-suspense and thriller fans. This, soon to be a bestseller, story stands well on its own but as in all great series, is best read in order. The narration by Therese Plummer is absolutely marvelous and will leave listeners biting their nails waiting for the next terrifying happening. The emotion she puts into the story at the exact right times is exceptional and gives the audience more of a 360º enjoyment of the novel. She’s got all characters (especially female) down pat, but it’s definitely her depiction of Evelyn that is flawless. 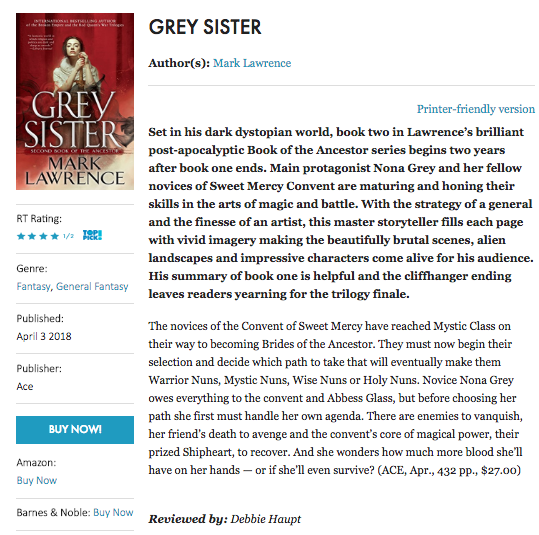 I reviewed Grey Sister for RT Book Reviews just a few months later they would close up shop after 37 years. 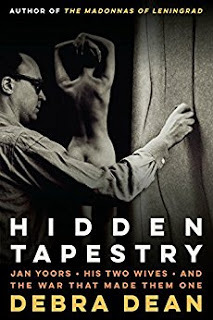 Debra Dean's debut The Madonna's of Leningrad is one of my all time favorite novels a poignant WWII tale about the winter Hitler invaded Russia and now she's written a fantastic non-fiction biography of Tapestry Artist/Photographer Jan Yoors. Wow it was fantastic. Picking a favorite author for someone who reads as much as I do is like picking a favorite child but it's true that Sarah Morgan is one who holds that status. She's a master storyteller who's first foray into Mainstream Women's Fiction is a HUGE hit for me and the rest of the civilized world too. Morgan’s first foray into mainstream women’s fiction is a huge homerun, a fresh, fast-paced emotional novel with a lot of heart. 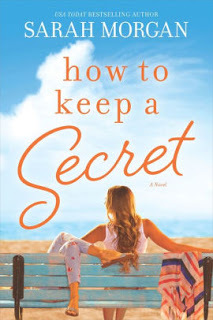 Its a fantastic tale about keeping secrets, grief, starting over and second chances and proves you can go home again. It’s poignant, about family dynamics and dysfunction but it’s also full of well-timed humor and wit. The author has absolute mastery over all her mesmerizing, memorable characters but one angst-filled, not sure where she fits in the world troubled teen who suffers a terrible loss then moves across the ocean is a stand-out and how Morgan develops Mack’s character so that readers will experience every one of those emotions with her is simply amazing. Be prepared for a one-sitting, hard-to-put-down page-turner that fans of Karen White, Kristin Hannah and Susan Wiggs will simply adore. Carla is one of the many authors I first found reviewing for RT Book Reviews who have become an auto read, go to for me. Her Sharpe and Donavan series is one of my favorite in the Romantic Suspense genre and 8 novels in it's going strong. Number eight in Carla Neggers spellbinding Sharpe and Donovan series, Impostor’s Lure, is another fantastic magic show featuring the author’s iconic cryptic clues, slight of hand and red herring crime solving techniques leading the unsuspecting characters (and readers) to wrong conclusions and multiple dead ends. And where the only ones who know the truth are dead or conveniently in a coma. Colin and Emma who at series start seemed an unlikely pair has continued to wow with their case closing skills and beautifully solidified their relationship in spite of and because of their differences. The amazing atmospheric narrative, dramatic, breathtaking seascapes and strong yet flawed characters give the read a certain modern day gothic feel and the OMG ending will render more than a few jaws to drop. The past story character catch ups keeps fans up to date with the goings on in Maine and abroad and even though this has good stand alone components its best read in series order. Kristina is another one of those authors who have such a poignant way to make history come to life for her readers. I'm a HUGE fan of all her historical literary fiction. McMorris’s latest is amazing, historical fiction at it’s finest and based on a real photograph that once upon a time shocked America. 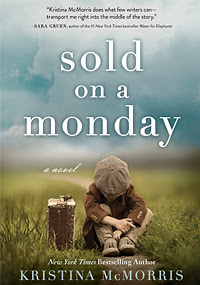 This fantastic tale takes readers back to Depression Era East Coast America where a sign announcing “children for sale” draws a floundering reporter’s attention and the consequences that follow his taking the picture. Rich with era appropriate dress, attitudes and dialogue the author weaves a story of intrigue, mystery, tragedy and redemption while taking her audience through prohibition era speakeasies, exposing them to the many ethnic “mobs” of the time period and the tragedies children suffer when the ones who should protect them either can’t or won’t. The storyline is accurately imaginative and with a fluent narrative and realistically good-hearted characters that grapple with right and wrong readers will find it hard to put this best-selling-bound novel down. Fans of both historical fiction and literary fiction will fall in love with this offering. 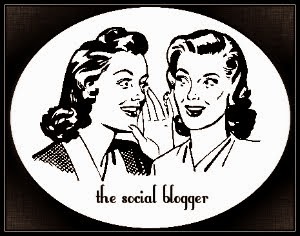 Master storyteller Kristina McMorris hits another one out of the park! JT is another of the few who rate high on my favorite list and I can take meeting her off my bucket list because I have! When it comes to flawed protagonists no one's got her beat. JT Ellison is a masterful storyteller as evidenced by her latest unforgettable story. 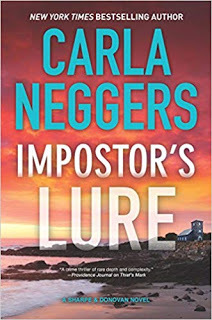 She starts off with a cryptic first chapter that will have readers scratching their heads followed by whiplash inflicting unexpected hairpin turns and blindsiding twists in this chilling, unputdownable thriller about secrets, lies and deception. The Colorado backdrops are breathtaking, the suspense is non-stop and palpable brought to life by the fluent prose-like narrative. The author’s research into DNA uses for both medical cures and crime solving gives the read credibility and makes it more interesting plus putting it in easily understandable terms makes it accessible to all. The subtle hints leading to the long-awaited with baited breath reveal of the multifaceted and many-faced villain is satisfying, terrifying and will cause more than a few jaws to drop. Although all the characters stand out it’s the unsinkable teenaged skiing phenom Mindy and her tenacious aunt Juliet who rock these pages. Be prepared to be surprised astounded and totally blown away by this best-seller bound keeper shelf read. Sarah is one of only two authors who have two novels that made the top list. She was also gracious enough to be a part of my 7th Annual #HoHoHoHarlequinHolidayExtravaganza for 2018. Morgan’s latest is contemporary women’s fiction at it’s finest a superb novel about family, loss, blessings and love. Set during the Christmas season in the wilds of the Scottish Highlands staring the most genuine cast of characters that ever graced the pages of fiction all equals in importance and all unforgettable. The backdrops are breathtaking the narrative is fluent and conversational with timely humor that mixes brilliantly with the tumultuous emotional subject matter. 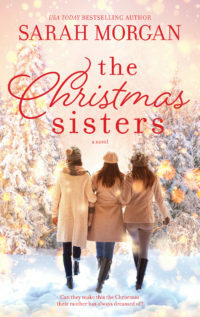 The author is a master storyteller and her portrayal of the sisters is amazingly authentic, the issues they have alone and within the family are so true to life it’s reminiscent of sitting in on a real family event. This is for more than just fans of the genre all lovers of exceptional fiction will love this novel that will soon be on every bestseller list. 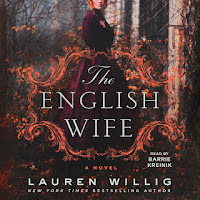 I have enjoyed Lauren's anthologies with Karen White and Beatriz Williams but this was my first of her solo novels. It was another Macmillan audio review and I LOvEd it! Rich in actual historical flavor it and she are now high on my must read lists. 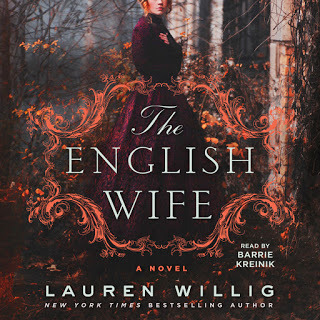 Willig’s The English Wife takes readers back to the Gilded Age and into the life of one of New York’s prominent families unceremoniously dropping them right into the middle of a complicated murder mystery. Told in multiple timelines and with Agatha Christie’s ghost whispering in her ear this master storyteller starts piling up suspects, while putting the pieces together revealing a family of wealth, stature, scandal and secrets. With a period perfect dialogue that will have readers googling unfamiliar terms and a vividly fluent narrative that keeps the pages turning the characters play each of their roles flawlessly dangling carrots until the final OMG ending. For fans of women’s fiction, literary historical fiction and murder mysteries this is the perfect choice to read by the fire on cold winter days. With a smooth Mezzo and immaculate intonations Barrie Kreinik’s narration is impeccable, perfectly portraying each and every character and adding special emotional touches where they’re really needed. Her rendition of the matriarch Mrs. Van Duyvil, the daughter Janie and the children were my personal favorites in her stable of brilliantly played parts. 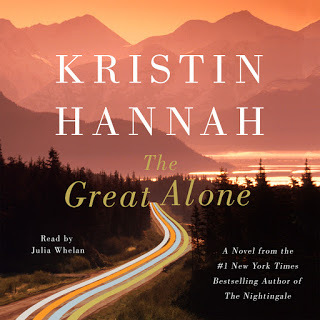 The Great Alone was another Macmillan audio review but I would have bought it none the less as Kristan is an auto buy for me. Hannah’s latest, The Great Alone is about new beginnings and dangerous old habits. Set in the recent past of the 1970s with a third person narrative that gives readers the big picture of an enormous landscape this author once again tackles the lasting affects of war and the string of destruction wrought by one damaged war vet left untreated for a condition we now know as PTSD. He’s a villain and yet the audience is expertly led to feel empathy and understanding for him. Her portrayal of Lenny an, always in the middle, daughter who comes of age in Alaska is fantastic and seeing how she deals with the isolation and her father’s condition plus her absolute love of her mother and her coming to love the land of the midnight sun of summer and the endless nights of winter is unforgettable. It’s also a love of the land familial and passionate love stories plus love of community and a reminder that no one man is an island. Kristin has never disappointed me and I have loved everything she’s written but I think this piece of brilliant literature may outshine them all. This is my first experience with Julie Whelan and I enjoyed her beautifully articulate voice which is a perfect way to enjoy this epic tale as she dots all her Is and crosses her Ts and gives an unforgettably emotional rendition of the novel bringing to life the absolute enormousness of Alaska. Her vocal interpretations are remarkable and she catches both female and male intonations perfectly but her child voice is absolutely amazing. 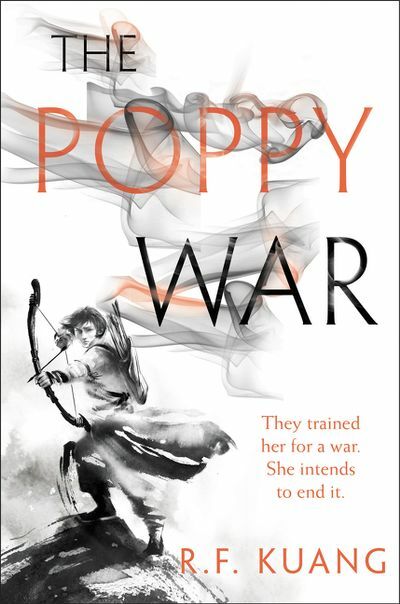 The Poppy War is another one of my RT Book Reviews, unfortunately they've already taken down the site so I can't retrieve the actual review but here is my copy. Kuang’s debut, first in a new trilogy is an insightful, thought provoking Asian-inspired coming of age fairytale stocked with myths, legends, lore, politics and power struggles, introducing Rin the unlikely impoverished orphan beating all odds. The narrative is an impactful, impressive symphony of words granting life to this incredible morality tale. Setting the stage for an epic fantasy is an understandably enormous undertaking but this author does an exceptional job of world and character building giving the first half an expected slower pace making the second half an expeditious brutal beautiful bevy of bloody battles, wielding both swords and magic and making readers long for book two. 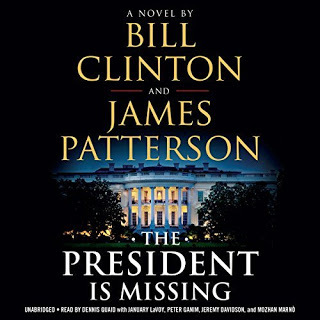 When I saw that former President Bill Clinton wrote a political thriller I knew I had to have it and when I saw that the audio was being narrated by Dennis Quaid plus a bevy of talented voices I knew I would be enjoying the audio edition. It was Fabulous and Quaid's portrayal of the President was phenomenal. What an exciting rollercoaster ride, non-stop action from the first sentence until the very end about a high stakes doomsday threat that would bring the US to her knees. 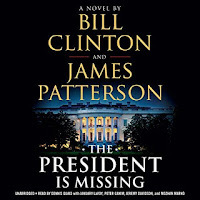 Patterson and Clinton have combined talents and efforts to put together one of the timeliest, and best political thrillers ever! POTUS is charismatic, passionate and compassionate and best of all he’s a Patriot in every sense of the word always putting the country’s needs before his own even at the cost of his life, he’s also a recent and still grieving widower who lost his compass and the love of his life. The cast of memorable costars are also utterly believable from the Secret Service men and women, the computer experts racing against the clock to the terrorists threatening the country. The in your face dialogue enhances the readers appreciation of the desperation this man and his small army of experts are facing and the short chapters heightens the tensions and complexities of the plot. Plus the real time three-day timeline magnifies the impotent feelings of those pitted against the enemy. For the most part the tale is non-partisan except for the speech at the end that could have easily been spoken by our former POTUS author but is very good. If these two have the thoughts to team up again or if Mr. Clinton ever decided to try fiction on his own I’d be game. Dennis Quaid delivers an unforgettable, emotion filled performance as POTUS keeping listener’s hearts in their throats and stomachs queasy waiting for the other shoe to fall, by far one of the best renditions going. The narration of the other talents are all fantastic especially the voice of the classical music loving assassin. 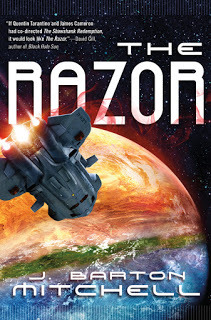 I loved Mitchell's Conquered Earth series so when he reached out to me about reading his new sci-fi thriller series debut I said, Scotty beam it up!!! Mitchell’s latest is a sensational scare your socks off, fast paced adult sci-fi apocalyptic thriller set roughly 150 years in the future on an unwelcoming penal colony planet and staring the most unlikely rag tag group of criminals heroes ever to grace the pages of fiction. The backdrops are beautifully brutal and the author’s narrative brings the amazing alien landscapes to life for his readers complete with strange lifeforms, altered humans from both successful and failed bio-experiments plus your requisite sci-fi nerdy engineer/scientist. The first-rate tale is tightly plotted, inventive with believably unbelievable futuristic people places and things that will keep the audience on their toes, hearts pounding while constantly waiting for the other shoe to drop. The real standouts of the story are his main players, Flynn, Key, Maddox, Raelyn, Zane and Gable. And the ending leads one to believe that fans will hopefully be making a return trip to The Razor in the future. Well-done Mr. Mitchell, well done! The Recipe Box was another Macmillan audio review and so inspirational to me that it inspired me to start my own family tradition by presenting my daughter with her own hand crafted and filled with family recipes, recipe box. Shipman’s (Wade Rouse) latest charmer The Recipe Box is all about family, family traditions, family in transition and passing the torch on to the next generation its also about choices and wanting to make your own mark on the world. The main protagonist in this novel, Sam, is a genuine caring woman who is looking for herself and how this intuitive author lets her do that is remarkable. With a soft soothing introspective narrative told in different timelines from the perspective of the amazing women in this family he weaves this tale and draws readers into the life and times of this family of survivors giving the audience a fly on the wall look into their celebrations and sacrifices. The family dynamics are spot-on especially the mother-daughter-grandmother and the tender love stories spun into the fabric of the tale give it heart. But the best part of it all is Love and the family’s motto “Pie equals 3.1415 oh who are we kidding, pie equals love”. The other amazing thing this novel did for me personally was to inspire me to start my own family tradition and this coming Christmas my daughter will receive a special handcrafted recipe box with many of my own favorite as well as recipes from family and friends inside and who knows maybe one day it’ll inspire yet another author to write about it. Susan Bennett’s narration was spectacular and gives an extra element of realism to the story drawing listeners into the tale. With her soft soothing articulate voice she nails all the parts wonderfully both male and female but her rendition of grandma Willoe was unforgettable and takes me back to my own childhood baking with my grandma and hearing stories about my family. There’s trouble with a capitol T in Ward’s 16th Black Dagger Brotherhood novel –– In the bedroom of Doc Jane and V, the cold winter streets of Caldwell and up in the sanctuary of the mysteriously missing Scribe Virgin. 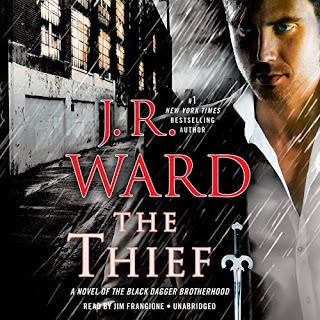 With non-stop action both of the human and vampire variety, Ward’s iconic unapologetic in-your-face dialogue and a storyline that keeps pages turning, plus characters who are literally larger than life, The Thief is a powerhouse. It’s also a turning point for fans who may have thought the series might be reaching it’s end as this amazingly inventive evil genius author gives fans a great big NO answer to that question by revealing more of this new enemy of the Vampire species. There are still some unanswered questions when the book comes to a close that will make fans that much more impatient for the next tome in this hopefully never-ending series. At this point in the series reading out of order is not recommended. The narration by the seductive voice of Jim Frangione, who owns this series, once again tops the charts. He breathes life into this novel giving listeners an added dimension by dotting all the intonations and perfecting all the vocalizations of the multitude of characters, many accents, both sexes and species with his excellent recounting. Well that's it for another year. Here's hoping it's even harder to pick next year's tops!! I really want to try The Poppy war! It was pretty cool Blodeuedd Happy New Year! Great group of books Debbie, I've read about three of them - yay for Sarah Morgan and Kristin Hannah.The Recipe Box is one I want to read and I am about to listen to an audio by Genevieve Graham that I won from your blog some time ago. Oh and I really enjoyed Sold on a Monday as well. Wishing you another wonderful reading year, Debbie! I've not read any of these, but several are on my TBR list. I hope you have just as many great read next year. I haven't read any of those yet. 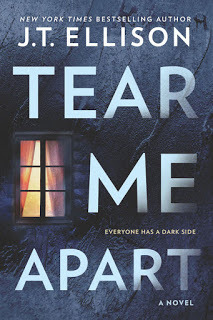 Tear Me Apart is the only one from your list that I've read. 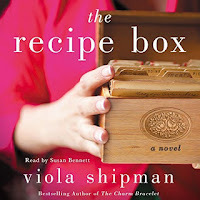 I see a bunch that are on my TBR list, including The Recipe Box and Consumed. Hoping good things are in store for your 2019!